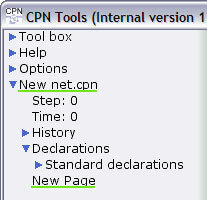 Tool box: A list of all the palettes available available in CPN Tools. 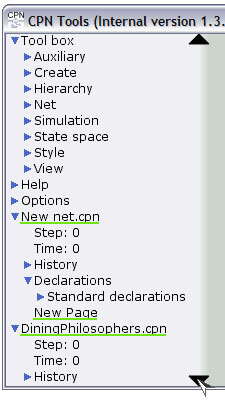 Net overviews: Overviews of the nets that are currently open in the tool. A blue triangle to the left of an entry in the index indicates that the entry can be opened to reveal more details about the entry. Click the triangle to open and close an index entry. When several index entries are opened, it may not be possible to see all of the index entries in the window. In such a situation, two arrowheads which are used for scrolling are added to the right-hand side of the index. To scroll the index, put the cursor over one of the arrowheads and press the left mouse button. To scroll faster, move the cursor either above or below the arrowhead while still holding the left mouse button pressed down.